These are similar views to Matlock Bank and Bridge - from near the Quarry, 1907; they were probably taken from the same viewpoint, or almost the same, but the cameraman has zoomed in for these two pictures. 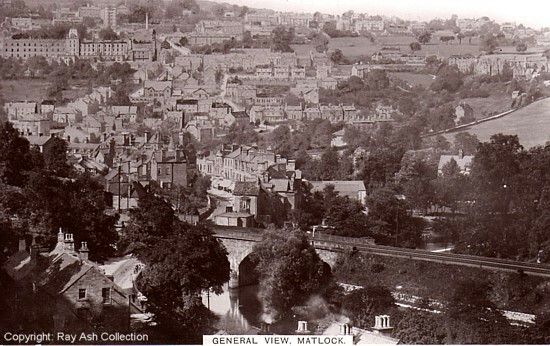 Both show the railway line crossing the river as well as Matlock Bridge and Matlock Bank. We can also see, bottom left corner, the Boat House Hotel's former livery stables, where the 4th Matlock Scouts met. The top view is the slightly later of the pair. It shows a number of people walking into central Matlock along the pavement opposite the Boat House though there is almost nobody outside the shops on the far side of the bridge. Smedley's Hydro was by this time very dominant on the Bank and had been for several decades; it was by far the biggest hydro. In the top image the changes to Rockside hydro have already been made, so we know the photograph was taken after 1906. The spire and tower of Matlock Methodist and United Reformed Church on Bank Road had been erected. However, in the coloured view below there is definitely no spire on that church on Bank Road so that picture was taken shortly before 1906. As Rockside looks to be almost complete the lower picture probably dates from 1905. The two semi-detached houses on Steep Turnpike, seen in both pictures and originally thought to date from 1901, were built in 1902 or 1903. At a Council meeting in October 1902 the Surveyor, Mr. James Diggle, reported that plans had been received for two houses on Steep Turnpike. It was decided that these particular plans be "disapproved", but he said that amended plans, showing w.c.'s instead of privies, would be considered. It was added that while the Surveyor must be satisfied with the foundations of the buildings, the dangerous nature of the road and the possibility of slipping had been pointed out to the architect. There had been more than one landslip on the road as, in 1898, the Surveyor told the Council that a "further landslip had occurred on Steep Turnpike Road, immediately below the wall which was recently built". Although the subject was not discussed in relation to the Steep Turnpike properties the Surveyor suggested and the Council agreed in 1902 that an ashbin should be included in all new builds in Matlock unless there was already an ashpit. The same meeting also debated an application for a temporary public tip on Bank Road on a piece of land the Conservative Club then owned. On the far right of the picture is a large field next to Steep Turnpike which ran almost the full length of the road. There is more about this on the next page. picture. There are a few vehicles on Dale Road on the far side of the bridge. 1. "General View, Matlock" published by Salisbury Ball of Sheffield; the card is number 198 in their series. Another card was posted in 1912. In the collection of, provided by and © Ray Ash. 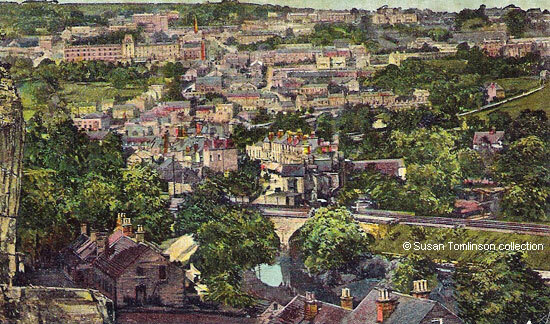 This card was also published by Loca-View of Sheffield as No.73 in their series. 2. No title. In the collection of, provided by and © Susan Tomlinson. "Derbyshire Times and Chesterfield Herald", 11 October 1902. Matlock District Council meeting. "Derbyshire Times and Chesterfield Herald", 14 December 1898. Council Meeting - a landslip.